When I first started writing my blog, one of the first whiskies I wrote about was Auchentoshan (pronounced ‘ock-un-tosh-un’) Classic, http://wp.me/p3Zt2k-7. If you read that post then you’ll know that I really enjoyed the Classic. I also have a bottle in my whisky collection. Looking to try more of the Auchentoshan range, I very recently had the opportunity to try their Auchentoshan Three Wood. Everything in the Auchentoshan range is triple distilled. In case you aren’t familiar with that term, triple distilling means distilling the product three times, this takes it an extra step further than regular standards. This extra step makes the whiskey more concentrated and pure. This whisky in their range is called the Three Wood because it uses three casks to mature the whisky. Those are American bourbon, Spanish Oloroso Sherry and Pedro Ximenez Sherry casks. Unlike the Classic, which to me was fruity and light, Three Wood is more complex and sweeter. They are both different and stand out in their own way. To me, out of their range the Three Wood has the deepest color with reddish hues. I’d attribute that to the two sherry casks used for maturation. It’s not only pretty to look at, but also nice to taste. 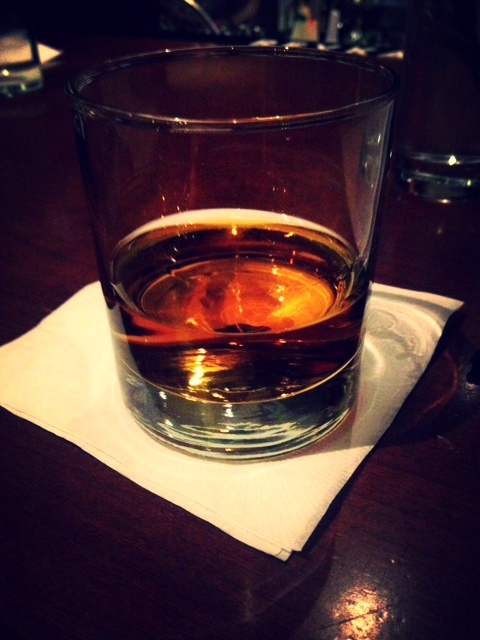 Palate: Cinnamon, sweet, sherry and at times I was touched with notes from the bourbon cask. For the Classic I roughly paid about $30-$40 for the bottle, the Three Wood however is more expensive. You can look to pay about $60-$75 depending on where you buy. This is one of the cases where I wish they had more miniature bottles out there to give everyone the opportunity to try before spending the money on a bottle. Now for all my non-whisky drinkers out there I wanted to share a story about the Classic to show you that not everyone has the same tastes. I am sure that if you are just starting to drink whisky, it’s a bit intimidating to hear all these other people tell you how they think a whisky should taste when in all actuality, there is no right answer. You either like it or you don’t and the notes you get when you taste, will not be the same as the person sitting next to you. After posting my original post about the Classic back in June of last year, my sister-in-law who isn’t a whisky drinker, thought it sounded great and wanted to try it to see if she could finally get into whisky since I obviously love it so much. I think I was more excited for her to try it than she was. One weekend I brought my bottle over to their place and a tasting occurred. The outcome, although my brother enjoyed it, she absolutely hated it. Bottom line, I really enjoyed the Three Wood but people out there might not. You however can’t build a palate for whisky unless you try different whiskies to know what you do or don’t like. I would recommend the trying the Three Wood. It has the right amount of sweet and is pretty smooth. Who knows, maybe my sister-in-law will try this one, like it and if she doesn’t, well, she won’t have any problems letting me know that.